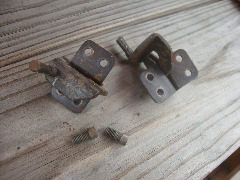 These parts are used and came off of the following machine. We will usually have only a quantity of 1 per part, unless otherwise noted. These parts may need a minor cleaning or rust removal. Refer to each part for more information. Stradivaro 301 balance wheel. Needs cleaning. Stradivaro 301 dual spool pin ONE SCREW IS MISSING AND 1 PIN BENT. Selling as is. Stradivaro 301 feed dog. Needs cleaning. Stradivaro 301 hinges. Needs cleaning. Stradivaro 301 light and face plate assembly. I had to cut plug end to remove from machine. Plug end will be included. Stradivaro 301 long spring. Will adjust for First Class ship. Stradivaro 301 motor bolts. These secure the motor to the bracket. Will adjust for First Class ship. Stradivaro 301 motor. Untested. Motor tuneup recommended. Stradivaro 301 upper tension assembly needs a good cleaning. Stradivaro 301 wire guide2. Will adjust for First Class ship. Stradivaro 301 lower thread guide by needle clamp. Will adjust for First Class ship. Stradivaro 301 presser foot bar assembly. Remove rust with Evaporust. Stradivaro 301 wire guide1 for motor and light wires. Will adjust for First Class ship.